If you follow me on Instagram, you’ve already seen this cute gingham top. And you’ll be seeing it again too! Super cute and comfortable and with the lantern sleeves and big bow, it packs a style punch, doesn’t it? At 5’7″ and long-waisted, I have my usual gripe … I wish it were an inch longer. On most, it will be the perfect length and with these higher waisted culottes it looked just right on me too! Exact top & earrings. Exact pants and shoes no longer available, but I’ve listed options. 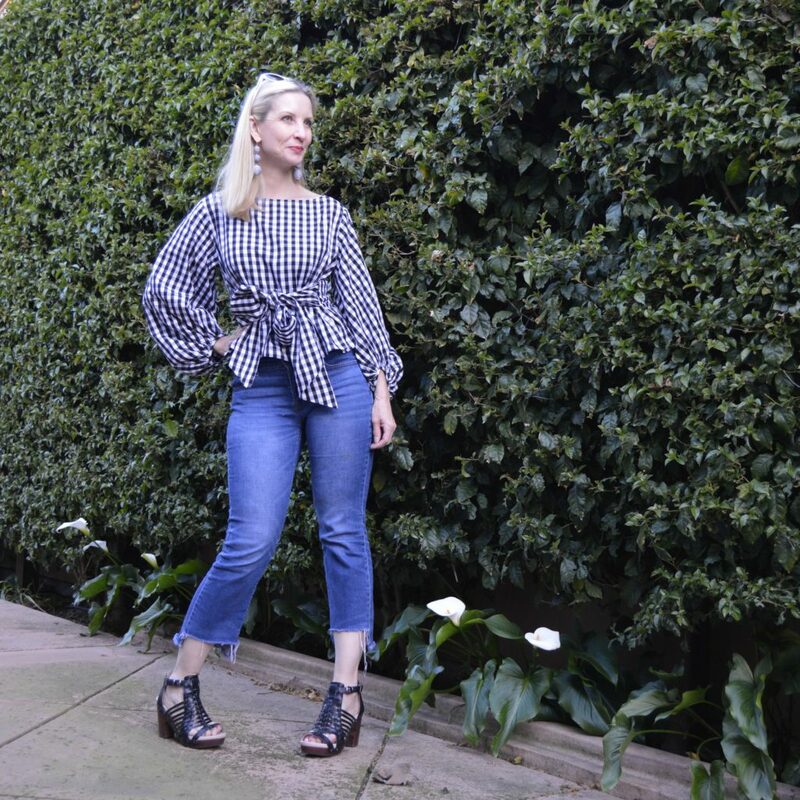 I also styled the top this way … Originally I liked it, but then thought maybe it had too much of an Ellie May Clampett vibe. Then laughed thinking that my younger readers will probably have no idea who that even is! BTW, these Jambu sandals are the bomb. So comfy that I actually wore them for a whole day of teaching. Hope everyone had a beautiful Easter weekend. I lost a dear friend, so it was a day of sadness for me. I know her bright spirit lives on. “The trouble is that you think you have time” … time to reconnect, time to say thank you and I love you. Remember that every day is precious and hold those you love close. Wow! That’s a stunner! I’m heading off to shop this gorgeous top! GINGHAM GOREOUS is what this is!!! LOVE!! But I want your outfit! Stunning! Beautiful top. Thanks for linking up to Creative Mondays last week. You are one of this week’s features..